The Architectural Design Association of Nippon (ADAN) was founded in 2014. Formerly KASNET, (Kansai Architecture School Network) we have been running a contest known as SHINJINSEN (Architectural Rookie’s Award) since 2009. KASNET was formed by a group of professional architects engaged in education at various universities in the Kansai area. Between 2009 and 2013, we held five SHINJINSEN contests, and have expanded our activities into Asia through the Asian Architectural Rookie’s Award. We established this association to further advance our activities and opportunities. Architecture is often conceived as being technical and exclusive to professionals. We aim to open the field up to the public, so that, like music and art, architecture becomes more approachable and enjoyable. We seek to explore the potential of human imagination, free from the traditional confines ofentities, language, mathematics, or graphics. We encourage cultivating crisp design sensitivity through traveling, communicating, and meeting people from different cultures and backgrounds. We strive to convey the joy of architecture to the younger generation, and establish a society where unique designers can be given the chance to grow and flourish. ADAN aims to contribute to the public interest through improving the overall quality of architectural design, by providing a medium of interaction and study for those involved in the profession, as well as in research and education. We seek to nurture a future generation of architects equipped with outstanding intellectual flexibility and ethical values. We contrive to bring about openness to the field by cooperating with other genres, and together exploring the potential of architectural endeavor. Gaining and sharing knowledge through travel and international communication is an important part of our philosophy, in the pursuit of proclaiming architecture as a culture to be appreciated and enjoyed more widely. We do not perceive architecture as simply the methods and technologies for creating structures, but as a highly intellectual and cultural pursuit. This is to grasp the inherent aesthetic composition that exists within buildings, and explore that potential as the source of human creativity. In order to achieve this, the act of architectural design must be theorised and systemised into a method of creative thinking that comprehensively draws on language, mathematics and draftsmanship. The resulting drawings, sketches, models, writings and even the realised buildings, must be evaluated and criticised accordingly from the point of view of their cultural value. 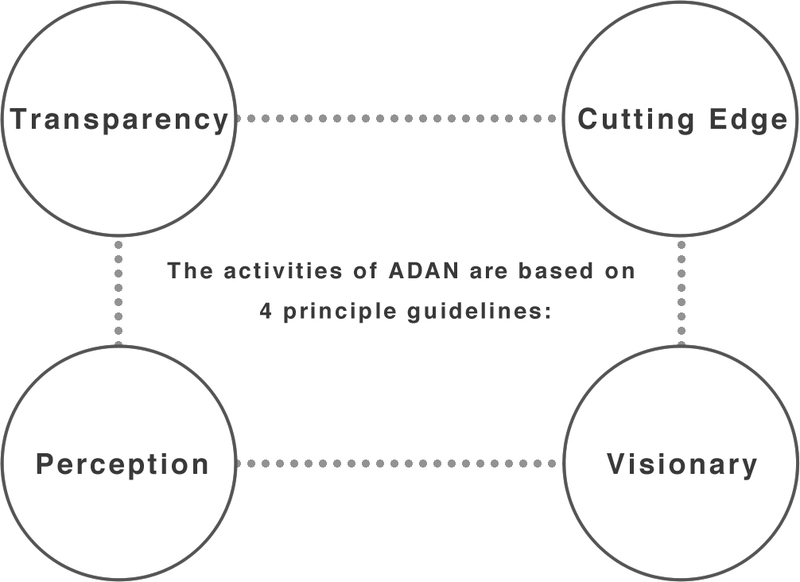 ADAN is open to all creators who share our view on the cultural and creative aspect of architecture. Architecture is not limited to the physical object, it is also a thought carried across time, a trace of spatial imagination from history. In architecture we can see the spatial thinking as the driving force of human culture, an experience inspiring surprise, joy, and admiration. Architecture speaks to our bodies and minds: we must understand it intellectually, and consider it creatively. If we consider spatial thinking from the point of view of architectural design, we will notice an important aspect in the cultural history of mankind – the coexistence of extrinsic and inherent viewpoints. We look at architecture from the outside and experience it from the inside. Architectural design occurs in the midst of the duality of relating to a space both externally and internally, and the continual shift of viewpoint between the two. The knowledge of the abstract and concrete, the whole and the detail, is what defines human creativity. Architectural design is a case of a spectacular practical knowledge.